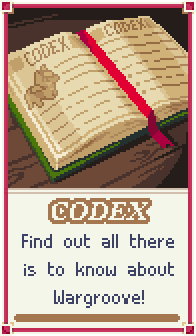 The information on this page is copied from the in-game Codex, "Rules" tab. A Wargroove battle is won when all other opposing players on the field are eliminated. A player is eliminated when their Stronghold is destroyed or their Commander is defeated. Campaign missions and customs scenarios may have different win conditions. Check the Overview screen to view conditions for the current battle. Units can move each turn before performing actions. The distance a unit is able to move is defined by its movement type and the type of terrain the unit wishes to cover. Movement is also affected by weather conditions. A unit's movement type can be found in the unit description, whilst the expenditure of movement for entering a particular terrain tile can be found in the terrain description. Air units are able to move over all types of traversable terrain at no additional cost. Offensive units have access to the 'Attack' action when in range of a hostile unit or structure they are capable of attacking. When reduced to zero health, a unit is defeated, and will be removed from the battlefield. The defender is able to hit the attacking unit type. The attacker is within the defender's attack range. The defender is not a Trebuchet or Ballista. When attacked, a unit's defence is defined by the terrain it is currently occupying. Defence is indicated by shield icons in the terrain description. Each shield indicates a damage reduction of 10%, up to a maximum of 40%. Some terrain types increase a unit's vulnerability - this is indicated with skull icons. Each skull indicates that the unit will take an additional 10% damage, up to a maximum of 40%. Neutral structures can be captured by any unit with the 'capture' attribute. A captured structure begins with half the health of the unit that captured it. Occupied structures must be defeated and returned to neutral before they can be captured. Occupied structures will counter-attack when possible. Structure health regenerates at a rate of 10% per turn. Structures have a range of functions. Refer to the structure description for more information. Villages and Strongholds provide an income of 100 gold per turn. Starting funds are set on a map-by-map basis. Players can recruit units by spending gold at a recruitment structure. Each structure can only be used to recruit a unit once per turn. Each unit has a different cost. Ground units are recruited with the Barracks structure. Air units are recruited with the Tower structure. Naval units are recruited with the Port structure. Some battles may limit the variety of recruitable units. When a unit is moved next to a structure, it may be reinforced to regain health. The structure loses health equal to the amount of health the unit gains. The cost of reinforcement is based on the value of the unit and how much health is regained. A unit may reinforce from multiple adjacent structures at the same time. All attacking units are capable of performing critical hits if certain criteria are met. Each unit has a unique critical hit criteria. Refer to the unit description for more information. Critical hits range from 1.35x to 2.5x damage. Wagons, Balloons and Barges are able to transport units. Moving a unit to a space adjacent to a transport unit allows the unit to be loaded into the transport. A transport unit's turn will not end when it is loaded. Unloading a unit ends the unit's turn. A transport unit may move and drop a unit in the same turn. Only footsoldiers and Dogs can be loaded into a Wagon. Any ground unit can be loaded into a Balloon or Barge. If a transport unit is destroyed, any units being carried are automatically lost. Commanders are exceptionally strong units. If a player's Commander is a defeated, the battle is lost. When attacking, defending or defeating foes, a Commander unit's 'Groove' will build. A small amount of Groove is also built passively each turn. A commander's 'Groove Meter' displays how much their Groove is charged. When the Groove Meter reaches 100%, the Commander can unleash a powerful special ability. Different Commanders build up Groove at different rates. Refer to Commander descriptions for detailed information on each Groove. Strongholds take half damage from all units. If a player's Stronghold is destroyed the player loses the battle. Fog of war restricts unit visibility by covering the map in fog tiles. Any enemy unit inside a fog tile is invisible to the player. Each unit has a sight range. This indicates how many fog tiles are removed around the unit's position. Sight is blocked by mountains, walls, forests and reefs. A unit can uncover a forest or reef by being placed in an adjacent tile. Ground units on mountains gain a sight range increase. Dog and turtle sight range is not restricted by terrain type. Structures are not hidden by fog of war. Ambushed units stop moving, and their turns end immediately. If a naval unit is Ambushed whilst under a bridge, it immediately defeated. Neutral weather has no effect on play. Air unit damage gains a x1.2 multiplier. Air unit damage suffers a x0.8 multiplier.